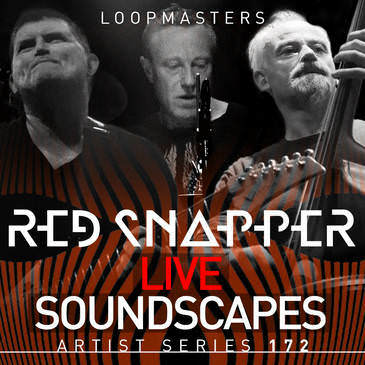 Loopmasters proudly present Red Snapper Live Soundcapes – a richly textured fusion of organic and electronic sounds from a group renowned for their unique performances and far-reaching influences. This Loopmasters exclusive is 100% Royalty Free, with all the depth and detail of a full Red Snapper release in one complete package – get down and dive in! Formed in 1994, Red Snapper have toured the world and have worked with some of the biggest artists on the scene – including Massive Attack, Bjork, The Prodigy, De La Soul and The Fugees. Rich, Ali and David have released critically acclaimed Albums and EPs on Warp, V2, Lo and Flaw Recordings – collaborating with Beth Orton, Gavin Clarke, Ollie Moore, Anna Haigh, MC Det, Alison David, Karim Kendra, Eliza Carthy and Tom Challenger along the way. They continue to take their live sound on the road, and are currently in the studio working on a new album. Red Snapper bring you 1.11 GB of masterfully crafted sounds, with Loops, One Hits and Sampler Patches direct from their studio with an aim to satisfy. The pack features over 300 Loops and 77 One Hits, laden with Afro-Centric rhythms, layered in Dub wizardry, wrapped in Twisted Jazz with a futurist edge. A host of studio-quality sounds awaits you - Drums include live Acoustic kits, Congas, Djembes, Recycled goods and various Percussion instruments – giving you texture, depth and insane rhythmic individuality. Hear the classic Red Snapper low-end sound with Double and electric Bass, featuring a mixture of fingered, picked, thumbed, bowed and slap playing styles - generating the hard, driving groove pioneered by instrumental Hip Hop. Add an impressive mix of classic Guitars, analogue Synths, Xylophones and more – and you can be sure that this collection of dark Funk will provide the perfect balance of organic and electronic elements you need to build something incredible. Red Snapper take you on a journey from 62 to 150BPM, with elements as wide-ranging as Hip Hop, Electronica, Dub, Pyscadelic Surf, Grime, Afro-Jazz, Breakbeat and more. The gear list features a Korg Wavedrum, ER 1, Monotron, Volca Beats and Monologue, Teenage Engineering PO 14, Roland SH101, and Moog Taurus. A 1970's Fender Jazz Bass, 1960's Fender Precision Bass, Bergerault Xylophone, Gold Top Gibson Les Paul, Rosewood Neck Telecaster, 1953 Magnatone Lap Steel and a Brazilian Rosewood classical guitar by Luthier Anthony Murray from 1977. A stunning selection of mics were used from Neumann, AKG, Telefunken, T Bone, Rode - ran through Neve preamps, and enriched with a Melos Tape Echo and Ridgefarm Boiler Compressors using a combination of Logic and Pro Tools. In detail expect to find 1.11GB of content with 376 individual 24 Bit Wav files. 263 Loops are included with 41 Double Bass Loops, 37 Percussion Loops, 36 Guitar Loops, 20 Kick Loops, 19 Snare Loops, 18 Drum Full Loops, 16 Atmos & Fx Loops, 14 Synth Bass Loops, 14 Hat Loops, 13 String Loops, 12 Synth Loops, 11 Electric Bass Loops, 4 Brass Loops, 4 Clap Loops, 2 Piano Loops and 2 Mallet Loops. 113 One Hits are included with 44 Dum Hits, 14 Fx, 5 Bass Hits and 2 Double Bass Multis. 281 Rex Loops. Red Snapper Live Soundscapes is so much more than a pale blue dot, it’s a pristine universe of sounds to add depth and clarity to your music. Log in to download a free taster pack, and check out the demos to hear more! Red Snapper are Rich Thair (Drums), Ali Friend (Bass / Xylophone) and David Ayers (Guitars).